Fifty-five years ago I visited Vermont on our first ski trips to the state. 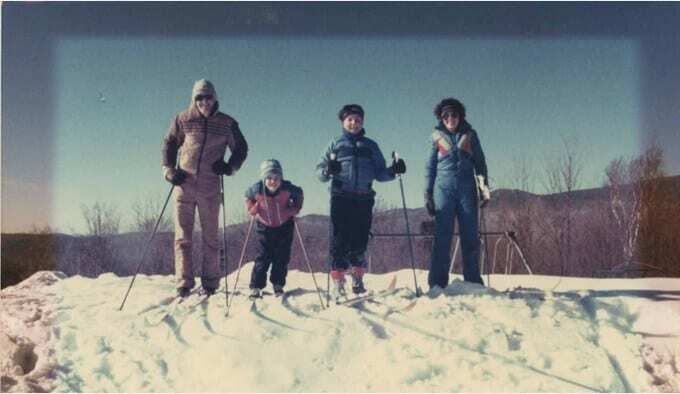 My dad took my two younger sisters and me on trips to Mount Snow, and once to Bromley and Dutch Hill, before we moved from Connecticut to New Jersey. Fast forward. Thirty-five years ago, John and I left New Jersey to move to Vermont. We had been second-home owners in Shrewsbury, Vt., and were in search of a different way of life, one that would incorporate more community (as opposed to economies, which was perceived as the “great enemy” of our generation) and a sense of living in nature and connecting with the land as well as with others. To be honest, my mother thought we were crazy. Having brought up her own family of five children in the suburbs of Connecticut and then New Jersey, she thought that it was just awful that we were taking her two young grandsons to live in the land of bears. Heavens, they might get eaten! I had been a Girl Scout (at Camp Alice Merritt) and loved the experience and the outdoors. Then, thanks to Dad sharing his love of skiing, I had become a gung-ho skier. As a high school teacher and ski club advisor, I had taken club members on trips to Vermont, Austria, Italy, Colorado and lots of night trips to Great Gorge and Vernon Valley. Being those were the 1960s and 1970s, many thought I was crazy. After all, managing a bus- or plane- load of 45 teens was no easy feat; and heavens, they might hurt or worse, get drunk and get me into trouble. I guess you could say I was of the more adventurous kind, even if I was a female -it was the age of women’s lib., after all. Husband John ‘hated’ all those New York Times articles that ran stories about people leaving city life for Cape Cod or the boonies of Vermont. He located land for sale in a New York Times ad and said, “call this number.” I did. His brother did the engineering on the site, and a New Jersey architect did the house plan. Having never lived in a rural environment, we were heading not only for adventure, but also an entirely different way of life. For one thing, we were giving up jobs to start out all over. I left teaching to run a B&B in our new mountaintop home – specially designed to appeal to guests who wanted to share our way of life with a view of Killington Peak to our north. We could see the top of the lift and the old peak lodge; and with binoculars or telescope, we could watch the skiers. “A crackling fire . . . good conversation . . . berry picking . . . tangy apple cider . . . fiery fall foliage . . . hot cinnamon popovers . . . the crunch of snow on a starry winter night . . . Glimpses of a New England world where time moves at a slower pace, where nature’s beauty can be savored at your doorstep, where community and friends are important, where flagging spirits are restored. It went on, idealistic as anyone could be who had fallen in love with old Vermont. I suppose that seems “nuts” to some, and it certainly makes me laugh now. But I was not alone in wanting something different in those times. We were living with Vietnam and Watergate; riots in Newark and Plainfield, NJ, where a policeman was stomped to death – never mind Watts, it was happening right there close to where we then lived. John and I left a good law practice and part-time college professor job in New Jersey to begin a law practice from scratch in Killington, those were the start-up-all-over-again years. John was sponsored by the Rutland Lorentzes (no direct relation) to become a member of the Vermont Bar, so we became friends. That was good because Stephanie Lorentz, the attorney, got lots of feedback on my stories in The Mountain Times and passed them on to me. Upshot, we did those jobs that enabled us to start over, and John pitched in to help me and I to help him. He drove down to the school bus mornings, and I did the afternoon runs. I needed to be home by 3 p.m. – we were old fashioned and idealistic enough to want to be there for the boys (versus giving them things like trips to Disneyland.) So I made freelance writing my new “work” and gave up teaching. I worked around the kids’ schedules and did the volunteer thing – church, Boy Scouts, PTO – and wrote late at night. We learned to heat with wood. The plumbing and heating contractor said a woodstove would be more useful in our living room than a fireplace so we got a Vermont Castings Vigilant, which was just coming into vogue. We also put in a Tarm oil-and-wood combination furnace to heat our three-level home. We put the fieldstone fireplace in the guests’ quarters – a walkout lower level of the home that features two bedrooms, two baths, a large Jacuzzi, sauna, kitchenette with dining area, and large living room with that “walk-in” fireplace as one writer from Boston Parents magazine called it. Next we knew, our full-time Vermont neighbors a mile-plus down the hill told their Massachusetts friends about us, and that started B&B visits from doctors and residents from the Boston Children’s Hospital. One of their wives was a writer and between her front page feature article about Lorenwood and their connections, we were always full. Yes, those were the days. Like-minded couples and young families came up and had breakfast in our dining room, most often made by John who became a great breakfast chef – still is and although we gave up the B&B after boy number three, he still makes me muffins and popovers on Sunday mornings! If the guests had kids, the kids ate out in our family room with our kids and watched cartoons. The parents loved the free babysitting and “adult” breakfast in the adjacent dining room with fire in the woodstove. We live in a beautiful place and our guests became repeat friends and part of an extended family. We also led cross-country ski expeditions outside our door. No manicured trails, just trails packed down by snowmobiliers or bushwacking trails. They loved it – we loved it. Amenities in those days meant downhill at Pico, Okemo, or Killington and a Beta VCR machine with the TV in their living room with a growing library of movies to watch. It included the sauna and whirlpool. And an occasional car start by me. The staple we provided was R&R (rest and relaxation) and good conversation. Guests could hole up in their quarters and even elect not to take breakfast. They had the entire downstairs to themselves as we didn’t take more than one party at a time – unless, of course, several couples or two small families wanted to come together – a hideabed in their living room meant we could accommodate eight in total. But most of the time, they shared their time with us and us with them. So much so, that we restricted visits to fall foliage and winter so as to have summers just for our own kids. Eventually, John got busier at work and my writing notched up to the first Killington book, which took me five years. The simple life we came for was becoming extremely busy. The boys’ lives also began to fill up with Scouts, Youth Group, church, choir, and extra-curriculars like theater, soccer, and a-cappella school groups, which meant we had to drive them to the faraway school mornings because the school bus didn’t come that early and make more runs for theater at night. We gave up the B&B to pursue this new stage of family life. The adventures didn’t fail us though. We saw our first bear from the safety of our car. Foxy Loxy never ate the boys although he did cross their paths as they came up from the tennis court to watch the Dukes of Hazard on Friday nights while we played into darkness with friends. There was even a snake that made its way upstairs when a lower door was left open – a babysitter shoed him out of the house for me as I faint easily. We had an orange crate – Volvo station wagon – that couldn’t get up the big hill when there was deep winter snow or even one inch of warm slippery spring snow that hadn’t been plowed. That triggered buying four-wheel drive vehicles so John could get to work and me home with the groceries and kids. Our first was a used Jeep that I used to push my parents’ big Buick up the hill one winter. When baby Jim was born, I got an AMC Eagle – I had had to walk home pregnant the winter before and John said, time for that safe Volvo to go. Then it was on to a Subaru and as the boys grew bigger, then we traded the Subie for a big Jeep Cherokee. Then more Subarus; we currently tally eight of various models. Some winters the town plow couldn’t get through the deep snowfalls and had to use a front loader to clear the road to us. Christmas 2002 it snowed so much that we couldn’t get home till the town plow went up our hill. If the road commissioner hadn’t told him to go up our driveway, we never would have made it out to our son’s wedding rehearsal the next day in NJ. Mud season was just as treacherous – more so some years. There were a good number of walks home to get the Blazer to pull the four-wheel drives out of the mud. Our first plow vehicle was a small, used International jeep – the kind on Mash as I recall – with holes in the floor boards and a stick shift. Our first Christmas it took all day to plow our driveway with it as we had over three feet of snow and it kept coming down. We could only move snow down the driveway as it wasn’t powerful enough. The next year we got the Blazer and it rained for Christmas. The Blazer never failed us, although I did get it stuck more than once while plowing heavy spring snow and dented in the doors from bouncing off snowbanks. I have photos of us digging it out or plowing the boys along with the snow. I did say we were adventurous, right? Another side to rural life was that if you wanted your kids to have other kids to play with, you ended up hosting them. So I imported boys and then started Cub and Boy Scouts. A woman could not be a Scout Master (cub leaders were ok) when I started in the 1980s, but they could when I finished in 2000, and I was one for lack of a male leader until our oldest sons returned home to lead the troop. Rural life necessitated doing what you wanted for your kids. We became very active in church, teaching Sunday and Vacation Bible School as well as singing in the choir “as a family” and helping out by serving as trustees and then chairs of the church – now treasurer and trustees. Some things don’t change. Being an active volunteer in our community, after all, is part of what we came for- an observation, not a complaint. Believe it or not, I got seven years worth of weekly newspaper columns from the rural life here. Well, he never got that porky despite some late nights in the woods, but I sure got a surprise when cleaning for guests that fall. I had said “hide the gun under the couch downstairs where the boys can’t find it.” I meant under the couch not under the seat cushions. But that’s where I found it and removed it before some romantic couple got moving and maybe triggered a bigger bang than they had bargained for! That same porky (I think) once got up on the front deck where I had put a mini-wheel bike to block his entrance. When I saw him, I grabbed my sponge mop and pushed him away. Well, he hopped on that trike and rode it down the stairs, never to be seen again. I had quills in my mop as proof, and a souvenir. In contrast, Mom wrote to me during that time and explained that the bakery in North Plainfield, NJ, where John had taken the boys to get Sunday donuts was the site of a serious robbery and that the man I babysat for one New Year’s – and for whom she worked as a bookkeeper – hired a mobster to kill his mistress’s paramour and hid the body parts in a yard. Did that make rural Vermont dull by comparison? Safer? I’m not sure. Looking back the boys had good schooling, a good time, and grew up to be decent citizens and family men, and they still come home to visit. Now, we contemplate growing older and moving off the mountain. I don’t really want to think about ever leaving the spectacular views that drew us to this site. I love saying good morning and goodnight to Killington Mountain, six miles north as the crow flies or to Whiteface to the west. The sunsets, mountains, and cool summers are part of the very fabric of our lives. Maybe some day a young family with dreams of “getting back to nature with the amenities” will want to move to Vermont and raise a family of kids who like to shovel snow, mow the lawn, plant gardens, and run a log splitter so they can haul eight cords of wood and pile it high so as to keep warm by a fire. Sure they will ski and snowshoe and have adventures camping out on the land and learn to play tennis on a clay court, but they will also learn to be part of a family by performing chores and being needed. That goes for school and community activities, too. In the final analysis, I think that is part of being connected and the best part of rural life. To be sure, it is not easy at times, but it can provide the stuff of dreams for people in search of something just a little different and, perhaps, a tad adventurous. They seldom believed me. I probably wasn’t that convincing.